Cardiff, July 30th around 11pm local time. I have just witnessed Madonna’s very first European show of her Confessions World Tour 2006, what an adventure. It cannot be expressed in words what happens on and around the stage: tricks of illusion, impressive images, theatre, disco, acrobatics, rocking guitars, the newest projection techniques, emotional messages, whirling dance…. After the long wait (saving money, ticket sale in April, spending the night in front of the post office, stress whether you would receive your tickets in time or not, hoping to get time off work, travelling, guarding your spot in the queue for around 20 to 24 hours, surviving the rush in front of the entrance and did I mention saving money already? ), the first show is over before I know it. Right before midnight you are outside again and you think ‘what is it that I have actually seen?’. But I can call myself lucky, because I managed to purchase tickets for three shows in Paris (28,30,31 August) and two in Amsterdam (3 and 4 September). Enough time to soak up every detail of this show. My stomach needs food, my bum feels like wood, my feet are asleep, my blather is full, but these all disappear when the lights go out, the music starts and Madonna’s voice fills the stadium. Sounds of galloping horses in surround system sound, combined with beautiful images on the screen and a giant disco bal descending from the roof. Then the bal opens and an amazing sound fills the stadium, that of the thousands of people witnessing Madonna standing right there. Surrounded by her dancers who are now portraying horses, she demands them and tames them, but with a big wink as only Madonna can do. While ‘Future Lovers’ is playing she has the audience in her spell, and we cannot be tamed! The stadium is in complete ecstasy and will remain like this for the next two hours. After the show’s opening, Madonna shows the crowd how amazingly flexible her body is on a saddle like never before. She’s making fun of her fall off her horse (a year ago) during the singing of ‘Like A Virgin’. On the video screens we see x-ray pictures of Madonna’s broken bones, caused by the fall off her horse. But ‘Jump’ proves that her bones have definitely healed, time for acrobatics of the highest level. On a platform lowered onto the catwalk a bunch of well muscled man are jumping like you wouldn’t believe. When you’re standing close to this, you can actually feel the wind they produce by their jumping and you can see the sweat flying off of their well trained bodies. 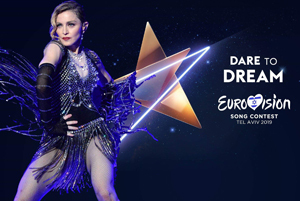 Madonna then mingles into the spectacle and then starts to prepare for the much talked about performance of ‘Live To Tell’. The stadium is in complete darkness, the music builds up and on the video screens we see time. From the stage the cross rises, made of silver mirrors, because that is what Madonna does ‘holding a mirror in front of our eyes’. She here asks for our attention regarding the help that people need from one another and specifically for the millions of orphans suffering from aids in the third world countries. She’s fighting to stop the counter that keeps on counting till it has reached the number of all of the millions who have died of aids. ‘How will they hear, when will they learn, how will they know’ is a part of the song. But outside of the spotlights Madonna does more then that, a large portion of the money that this tour makes will be donated to an organisation to help the orphans in Africa www.raisingmalawi.org. Thousands of people have tears in their eyes and Goosebumps all over. Nobody is left untouched, because this gets to you, just like the scenes that follow. During the song ‘Forbidden Love’ two dancers get on the stage, each have a religious symbol on their bodies. ‘Are we supposed to be together? ‘ is what Madonna sings. 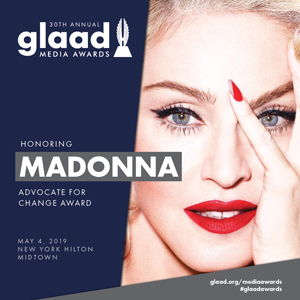 The songs ends with a beautiful dance between the three of them, in which only the arms and hands are used, and Madonna keeps on trying to connect them. Eventually the men leave the stage as brothers, shoulder to shoulder, as it should be. The song ‘Isaac’ is a jewel and the combination of Madonna’s and her friend Yitzhak (Isaac) Sinwani’s voice bring some calmness to the audience. But then suddenly a beat kicks in, dancers get on the stage and we hear the first sounds to ‘Sorry’. A great dance follows and the stadium appears to be one jumping madness. The anger that she portrays in this performance is amazing, eventually Madonna is the winner in the performance: you can love me or leave me but this is who I am, like it or not. Right now Madonna is not on stage, but her message is being displayed in 3D on the screens. The video makes fun of George Bush and other so called leaders. We see painful war images, terrible nature disasters, poverty, violence and many victims, animal and human. 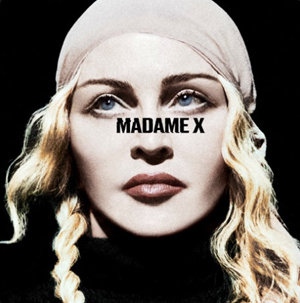 ‘Don’t explain yourself, ‘cause talk is cheap, there’s more important things then hearing you speak’ we hear Madonna’s voice singing, while the president of the USA keeps on blinking. In whatever country I am in seeing this show, everywhere the images receives the same reaction by the audience. In Paris a fan holds a banner ‘Madonna for president’, she certainly has our vote. After a short break, Madonna dressed in tight jeans and a black rock ‘n roll jacket enter the stage. She’s got a shiny electric guitar hanging over her shoulder, the skyline of Manhattan is displayed in neon on the screen. ‘I Love New York’ begins. During the last show in Paris we were served with a very nice extra in this performance. The American guitar hero Lenny Kravitz entered the stage and rocked along to the song. During the wait in the queue outside we were already wondering why they were rehearsing this song over and over again inside, so here we were treated to the answer. The rocking continues with ‘Ray Of Light’, Madonna is completely in her element. Jumping with her guitar she gets the whole stadium going, white lasers go over the audience so we can clearly see that not a soul is not dancing or jumping, the stadium is one giant jumping crowd, hands in the air and we wave them like we just do care. Sweating all over we are gasping for breath, we deserve a little break now. But Madonna doesn’t want us to stop and gives her all with a breathtaking performance of ‘Let It Will Be’. She is very close to the audience now, we are on our toes and reach with all our might, just to try and touch her, unfortunately I do not succeed. But being this close is just as impressive. You can see every detail of her face: the milky white skin with here and there a drop of water, the catlike eyes that sometimes appear to be blue, green and then grey, her muscles that control her every move on those killer high heels. It is very awkward because she seems light as a feather, but her moves are so energetic that she comes off as such a strong presence. It is almost such a surreal experience that you cannot talk about this, unless you have experienced this yourself. Then the music becomes silent and Madonna sits down on the tiny stairs at the beginning of the catwalk. There she is, surrounded by her fans. During each show this is the moment that Madonna speak to the audience. She speaks briefly about the country and city where she is in, she has noticed that fans all over the world have come to see her. During her European tour she asks people for their nationalities. Probably someone once took a flag during the show, Madonna kept this in mind and ever since then asked for flags. In Paris fans have to smuggle in their flags, as they are not allowed inside. Still during the speech numerous flags pop up from all over. Everybody hopes that Madonna will notice their flag and speak to them. Then suddenly the screams grow louder and in the corner of my eye I see Madonna’s manager with a camera and to my right I see the man with the camera. It seems like this time there is a light above my head (no pun intended), my heart beats like hell and carefully I lower the flag. Oh my god, there she is, right in front of me on the catwalk. The most famous voice in the world I hear saying ‘and what is this the flag of?’. “Tibet!” I yell with all my might, ‘it’s my mother’s flag and she is also here’. The last part of my sentence gets smothered by the yelling of people around me when Madonna reacts with ‘Tibet? Oh WOW!’ The fans around me are screaming and tapping me on the shoulder. One half of my brain is in complete ecstasy while the other half thinks ‘this cannot be true, this simply cannot be happening’. Even now it is so hard to believe that this happened, that Madonna actually spoke to me. That we shared a moment, unbelievable. Hopefully one day I will stumble upon pictures of this moment, maybe then it will help me realize that it happened. After Madonna has seen all the flags she calls to us in an emotional speech for peace. She calls to us as we are here all together with different nationalities and religions under one roof. That we should keep in mind that this is the example for the rest of the world. We scream after Madonna ‘We are One!’, so loud that I am sure it can be heard miles from here. The music to ‘Drowned World’ settles us down, Madonna relaxes and sings every word with so much passion. Lots of fans have tears in their eyes. The emotions are still touched when ‘Paradise (Not for me) starts. 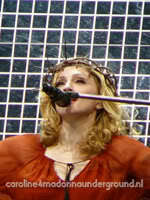 Madonna performs this mystical song together with Isaac and plays an acoustic guitar. On the video screens behind them we see blossoming flowers. We get carried away in this mysterious combination of images and sounds. Just for a moment there is silence in the stadium, but then it gets loose! The stadium turns into one giant disco. Dancers on roller-skates are racing over the stage and the catwalk, they know how to do what and when. They are jumping all over each other, what amazing stunts! Madonna comes up from the stage wearing a white suite a la John Travolta in Saturday Night Fever. ‘Music makes the people come together’ the whole stadium dances and sings. The song ‘Erotica’ has undergone a disco treatment, Madonna literally tears off her suit under which she wears an ABBA like catsuit. The classical ballet like dance that follows is one of my favourites in this show. Madonna and her partner seem to have this amazing chemistry together throughout this dance, it is beautiful. From here on we hear the warm tones of ‘La isla bonita’. The stage is all video images on the screens of a tropical island with a white beach, waving palm trees with the most gorgeous blue sea. My dancing feet are thinking ‘why aren’t we there?’. Unfortunately feet, we still have some time here! Madonna gets a white cape with the words ‘Dancing Queen’ on the back, which of course suits hertotally. When she turns around and faces us she spreads her arms and reveals the inside of the cape, lights inside the cape blink and ‘Lucky Star’ starts. A very joyful disco song from early on in her career. For more then twenty years this star has shone bright. And still she shines like no one else. During the first few seconds of ‘Hung Up’ everyone goes mad. Wearing a silky tight purple body, while golden balloons fall down on us she makes the temperature rise. Everyone screams, yells and sings. ‘Time goes by so slowly’…eh yeah before the show, during the preparations and long waiting. During the show the time flies, because this is truly the very last song. But Madonna gave it her all and continues to inspire us. And for a long time to come! Thank you to Madonna: for more than 22 years I looked at you, now for once you looked at me! Further I wanted to express gratitude to the whole Confessions crew, in front and behind the scenes: from manager to assistant, from dancer to stage builder. Without you no show. Thank you to all the workers at the stadiums who watched over my safety, great men! I had an amazing time with my Madonna-buddies Hans, Kimberly and Simon. Without you it wouldn’t have been such a grand experience. I look back with so much joy to all of the people I have met during the tour. Madonna continues to bring us together! Last but not least…….mum, thanks for your travel genes, for the compassion, the help and taking care of Pietje.